We love trees, and so do they. But, they aren’t as friendly as they always are; especially when you see extended branches that obstruct your mobility/vision and fallen logs that block your paths. Maybe, you have seen people working with a machine that makes brattling sounds and performs limbing, pruning, cutting, and similar jobs in just minutes! If you ever happen to handle any of these tasks, you need to understand the reality of the ‘electric vs battery chainsaw’ because both saws are known for these jobs. In this article, I’m about to present you a quick comparison and critical discussion to help you gather as much information you need for a solid understanding and wise decision. It’s important that chainsaws, be it an electric or a battery powered model, come with standard features to help the worker accomplish a wide variety of tasks, such as tree limbing, pruning, felling, harvesting firewood, cutting firebreaks, etc. Let’s get a quick view of the features of both battery and electrically powered models. The mechanical functionality that both saws are based on is the key to this ‘electric chainsaw vs battery’ discussion. A switch lock sits atop the handle and requires to be pressed forward with the help of a trigger pull (positioned under the handle grip lock). One press on the switch lock gets the saw started. As the machine starts, a finger-triggered system starts tracking the saw chain automatically around the chain bar. This action continues as long as you keep the trigger pushed. There’s a chain oil cap located to the right of the lock opens the oil reservoir/tank where the oil gets added and applied as the saw runs. Here’s a table to show the different chain bar sizes. Consider the sizes as you choose a battery or electric chainsaw. With the housing and other features being identical, most battery saws start as you press around the machine’s lockout button and trigger. However, many battery saws include two-step triggers. The main housing includes a couple of chain tensioning screws to mount the bar and saw chain while containing the right amount of tension during the chain movement. If you want to perform some maintenance, you can remove the nuts on these two screws and detach the body housing. When you want a quick adjustment of the chain tension, use the chain tensioning screw to achieve the required measurement of 1/8th-inch space between the bar and chain. However, you can do it manually too. For a battery chainsaw, the adjustment may be a quick, tool-free job. Use the plastic dial/knob to move the bar backward or forward until the adjustment is done properly. Then, you need to lock the saw bar down tight. For manual adjustments, you may want a combination of a screwdriver and wrench. The bar adjustment is essential when you have to use both saws frequently. If the chain feels tight all on a sudden, maybe, the bar isn’t receiving the sufficient amount of oil. Hence, you need to oil it properly. Some saws use an automatic oiling system requiring no manual squirting of oil on the saw chain. Just a trigger, and it’s good! Professional saw users loosen the chain almost every day, but that’s not required if you don’t have to put your saw into action all too often. During cold days, you may take care of the machine more frequently. Since the machine delivers brute force, safety of the operator must be ensured, and electric saw manufacturers haven’t forgot about that. Most chainsaws include a sturdy body housing, chain cover, and mount to help the operator stay protected and direct the sawdust to accumulation for easy cleanup upon the removal of the housing. Some advanced battery saws incorporate an automatic timeout system that lets the user operate the machine for anywhere between 15 seconds and one minute once the machine is turned on. A part of the battery chainsaw safety system is the switches that deliver warning alerts. As you turn a machine on, the lights (LEDs) starts glowing. Other warning lights alert users when any trouble occurs. A critical consideration to make as you want to buy a battery chainsaw or an electric machine is its preventive features to reduce kickbacks on operations. A battery chainsaw proves to be more conducive a choice than an electric saw as long as kickback hazards are concerned. After learning how both power tools work, the next thing anyone would probably want to know is how they can be used and what limitation they present. Well, I’m going to talk about the benefits of both chainsaws and of course, the setbacks too. The power of an electric chainsaw can be measured by the speed at which it cuts items. But, you need to use the same materials (to be cut), motions (cutting technique) and feed pressure. Small cutting, pruning, and trimming jobs require a certain amount (small to medium) of power, and thus, an electric chainsaw works great. One of the battery chainsaw benefits is its cordless design that allows better mobility. Although it isn’t typically as powerful as the electric saw, let alone the gas saw, recent models have seen some improvements in the batteries and voltage, thereby the overall performance. Here’s a table to show the different engine sizes. The typical advantage of a battery chainsaw is portability which isn’t free of setbacks. The battery being the source of power adds to the weight of the machine. Moreover, it limits the runtime, which is why these chainsaws aren’t recommended when you need to carry out hours of cutting, pruning, and trimming. A corded electric machine requires a power source within 50 feet of its location. It means the length of the power cord is usually 50-100 feet with some models using up to 150-feet cord allowing people to enjoy many outdoor applications. Also, the lightweight is one of the many electric chainsaw benefits making it somewhat a more preferable option. 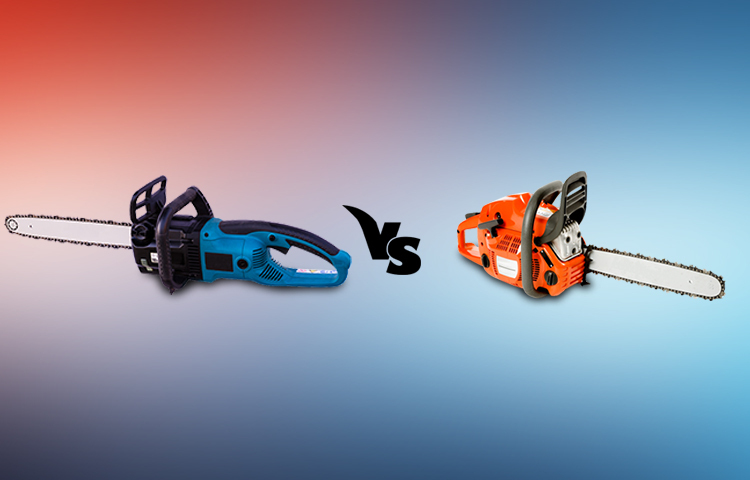 What’s the Catch from the ‘Battery Powered Chainsaw vs Electric Chainsaw’ Debate? Sometimes, you need a chainsaw for an hour of operation while at times, the need might be for a few more hours. Either way, you’re going to need the right saw. If you enjoy working outdoor and the job involves some quick operations, and these are what you do quite often, you may invest in an advanced battery chainsaw model, and borrow an electric one from your neighbor when you think you’re going to work for extra hours. However, you may need the saw more frequently (4-5 times a week) and for long hours without much interruption, an electric model seems more of a choice for you. Sometimes, professionals dislike these models for their noisy operation with higher decibels than that of a battery chainsaw. Also, you may want to avoid this style if you don’t like vibration to affect your arm significantly. A battery model produces relatively low vibration that makes it easy for comfortable operation. So, may I expect you’re almost ready to make your choice out of this ‘electric vs battery chainsaw’ discussion? One more thing, friend, make some time to give your chainsaw the care it needs. No matter which design or type you want to buy! The machine has to be maintained periodically since you’re not going to love to buy a new model each year. 10 How to Use a Heat Gun?